Today, ice plays various roles. A style element for cocktail drinks. A cool bedding for delicacies. A preserver of life saving drugs. The list is as long as it is diverse.And to meet your specific usuage requirements of ice in the best possible way, you can always rely on the expert, Blue Star. Blue Star, India's leading airconditioning company, collaborates with NTF (Italy), the world's leading ice machine manufacturer, to bring you sophisticated ice-making machines that freeze water and make ice effectively. These machines are hygienic, energy efficient, durable and easy to maintain. Blue Star uses its expertise and domain knowledge to give you the products as per your needs and requirements. 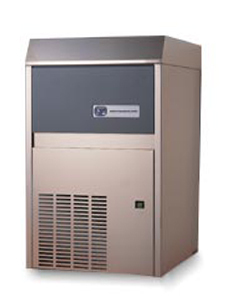 And with its widespread service network you can be sure of long life and optimum performance from your machine..
Gourmet Ice Cube Machines Blue Star - NTF Gourmet Ice Cube Machines produce compact truncated cone format ice cubes with slightly indented facets. These gourmet ice cubes gives a refreshingly cool boost to your drinks without changing the flavour. Ice Flake Machines Blue Star - NTF Ice Flake Machines produce ice in granular flakes. They are ideal for providing a cool bedding for foods, including fish and gourmet delicacies. The weight and volume of the ice flakes are tailored to suit your storage, transport and dosing needs. ideal for pharmaceutical products and the chemical industry, these machines boast of low running costs and minimal maintenance. A truly dependable product from Blue Star.